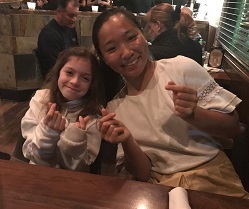 Seojeong, or SJ, is a senior in Paradise Valley, Arizona. 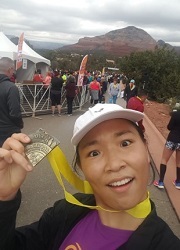 Originally from South Korea, SJ recently traveled to Sedona, where she ran her very first half marathon. “I was never passionate about running in South Korea mainly due to the poor air quality, traffic, and large amount of people. 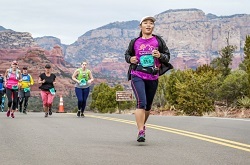 Here in Arizona, everything allows for running – great air quality and it is very spacious!” she shares. Her decision to run a half marathon emerged from an inner desire to do something that she had never done and would likely not do again. 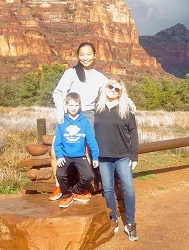 When a photo of the red rocks of Sedona popped up on her computer while she was searching the internet for opportunities, she knew that she wanted to further explore it. She read through the information about the marathon, marveled at the beautiful scenery, and decided to sign up. “I never thought about how hard it would be. I just thought how pretty the scenery is. There are things you shouldn’t worry about. ‘Just do it,’ as Nike says!” she explains. “When I asked her why she wanted to run a half marathon, she said that it sounded awesome. 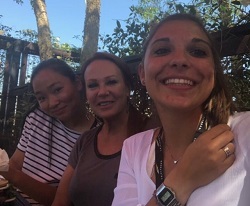 For her to finish the thirteen miles and walk away with a medal is an amazing accomplishment!” exclaims Carolyn, her Regional Manager, who describes SJ as a disciplined student who achieves good grades. She brought one bottle of water with her and ate a sandwich prior to the run. She wore a pack around her waist which held her phone and battery charger. She recalls people handing out food and water during the run, as well as sports gel, which she was not a fan of. During the race, SJ noticed that people around her looked so serious. She, however, had a smile on her face. “I did not know that I would be able to keep smiling while running. I was so overcome by the beautiful scene that I couldn’t stop smiling! If I run another marathon, I know that I will smile again!” she shares. SJ’s host mother, Carolyn, and a friend from Italy were there to cheer her on during the race and through the finish line. Carolyn appreciates SJ’s adventurous spirit and the hard work and dedication she applies to all tasks, large and small. “She (SJ) is so eager to learn all that is new, and she seeks out anything for the experience of trying it. She has done volunteer work and ran the half marathon. When she takes a break from studying, she loves biking the city and exploring. Watching her apply for college and receiving her acceptance letters in the mail has been a wonderful experience and a gift,” Carolyn shares. As for future plans, SJ would like to follow in her father’s footsteps and becoming a pharmacist. We look forward to following SJ’s journey and wish her the best of success!